I’m sitting here trying to come up with words to express how I’m feeling right now. First of all I’m very excited to complete this project. There’s always a sense of accomplishment (and relief) whenever you finish anything you set out to do. 52 pies in 52 weeks, done. I’m also a little sad because it has been a fun, creative, delicious journey. 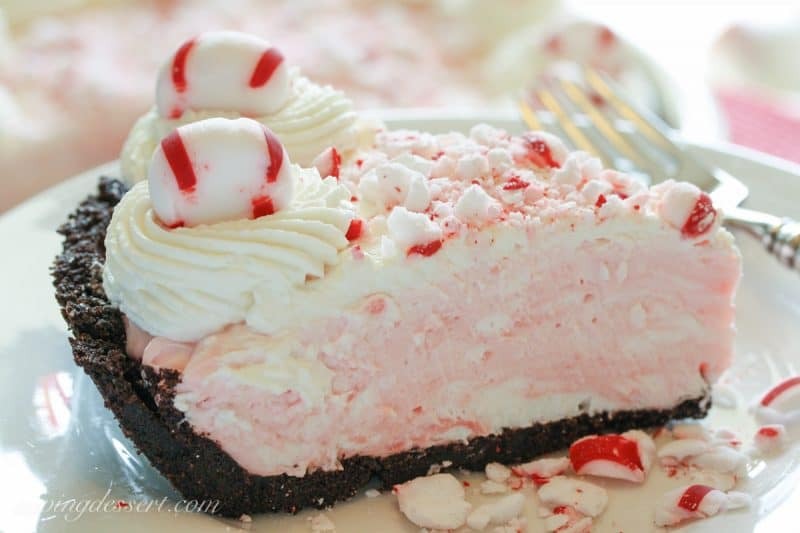 Let’s talk about this light, fluffy, pretty, peppermint pie! Some of the pies I’ve made this year were … uuhhh challenging; but this was not one of them. This was so simple with only a few easy steps. 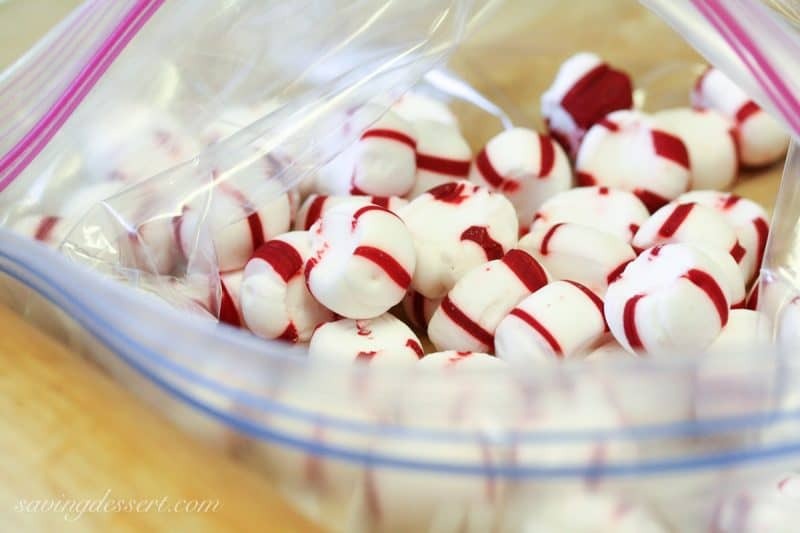 If you have soft peppermints laying around after Christmas this year, I know what you can do with them! Start with a simple homemade chocolate crumb crust. I’ve always wanted to try these chocolate wafer cookies in a dessert so now was my chance. 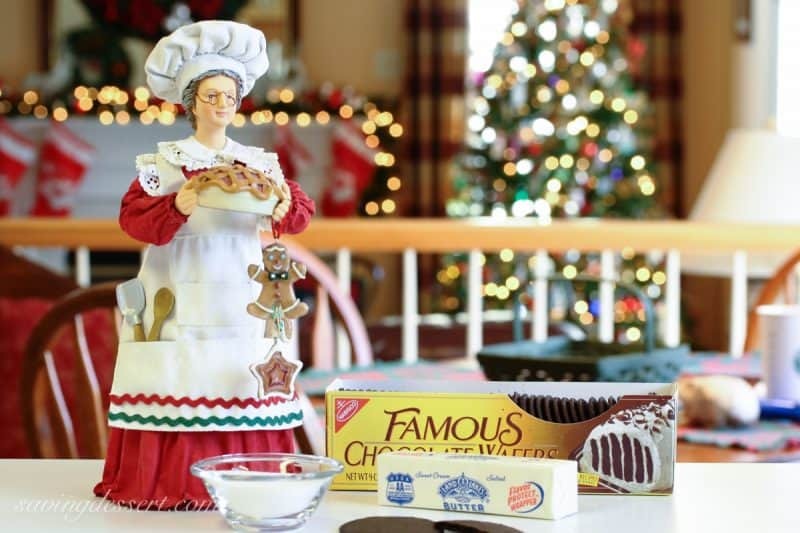 You see Mrs. Claus stepped in to lend a hand, along with a little sugar and butter too. 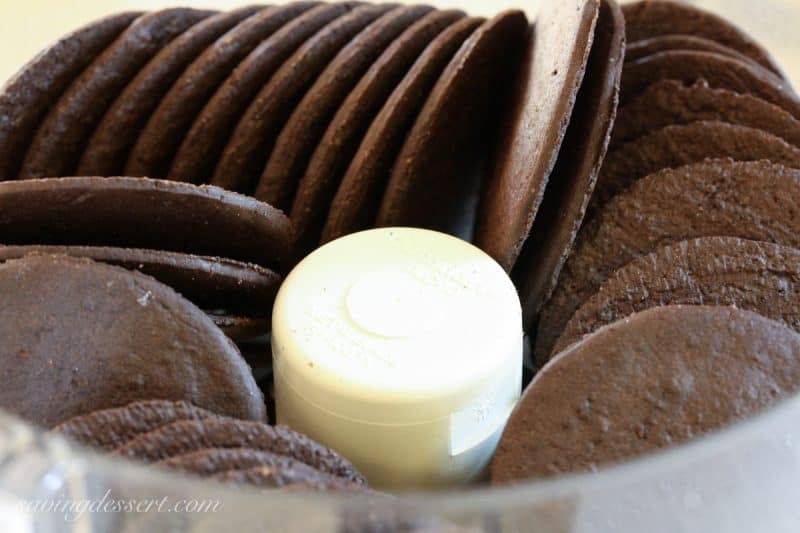 Place the entire 9 ounce package (minus one or two) of chocolate wafer cookies in the food processor. Pulse the cookies with the granulated sugar until ground into fine crumbs. Add melted butter and pulse until well mixed. Press the crumb mixture into the bottom and up the sides of a 9-inch pie place lightly greased with Pam. Bake in a preheated 350 degree oven for 7-8 minutes. Allow the crust to cool to room temperature while preparing the filling. For the filling you will need a heaping cup (plus more for garnishing) of crushed soft peppermints. I found the Red Bird Brand (the original soft peppermint) on sale so these are what we used. Any soft peppermint stick or candy will do fine. Bob’s peppermints are a popular choice if you can find them. Place the peppermints in a large Ziploc bag. I took mine out to the garage and used a hammer to crush them on the concrete floor. Crush extra for the garnish. 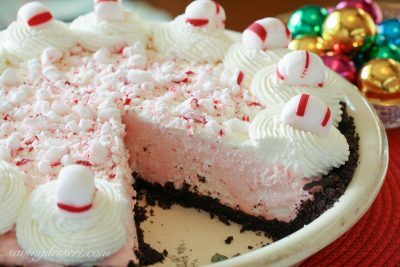 The filling is made from heavy whipping cream, unflavored gelatin, cool water, crushed peppermints and peppermint extract. 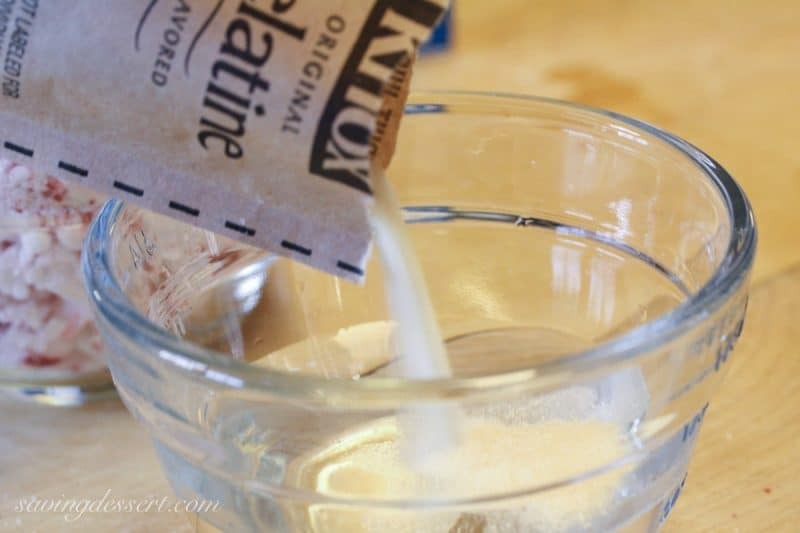 Sprinkle the gelatin over 1/4 cup cold water and set aside. Allow the mixture to soften while preparing the filling. In a small saucepan add 1/2 cup whipping cream. 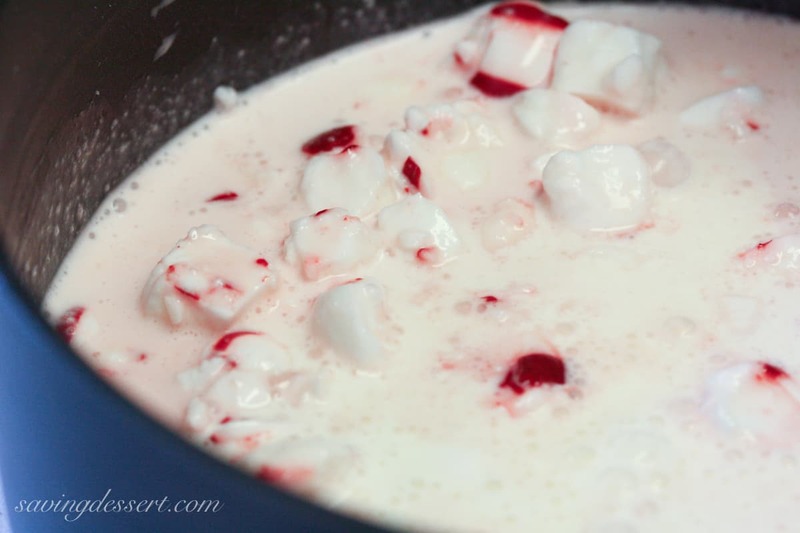 Add the crushed peppermints to the heavy whipping cream and cook on low heat until the candy melts. If you crushed the candy into small pieces this will not take long. 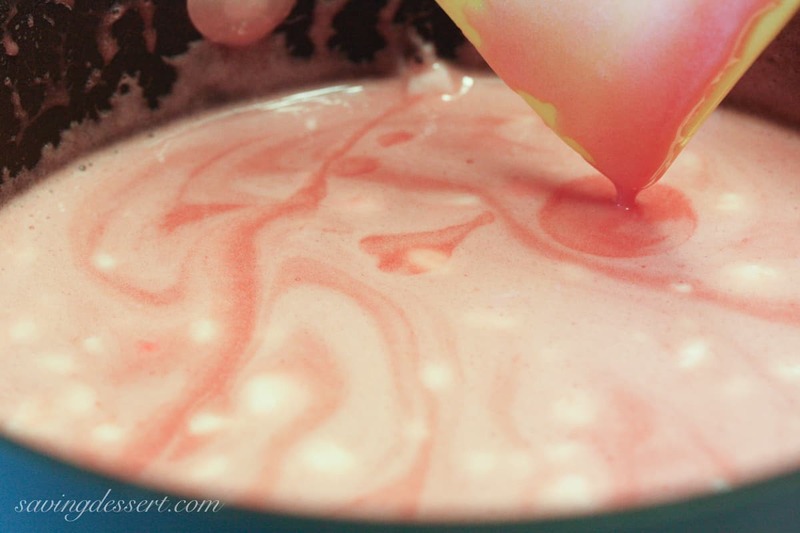 This candy turned the cream a bright pink color. If using Bob’s brand peppermint it may turn a brownish-pink color. This is fine too. 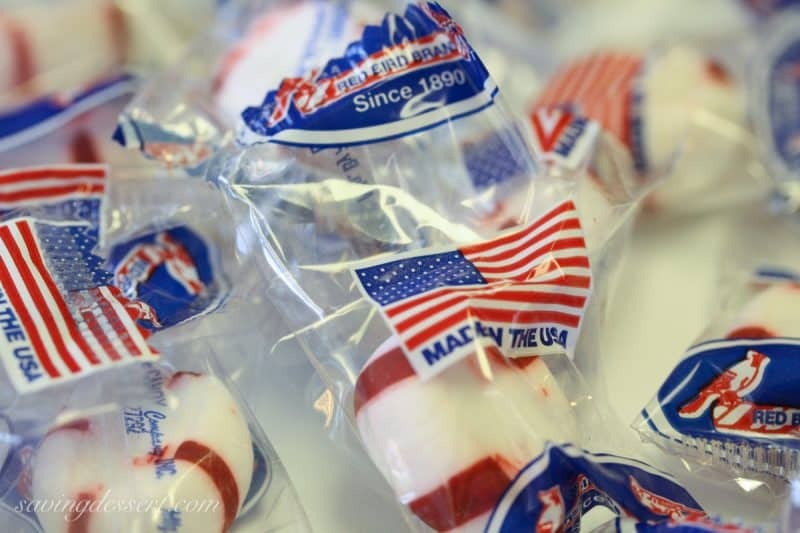 Once the candy is melted, add the gelatin mixture and peppermint extract and stir to combine. 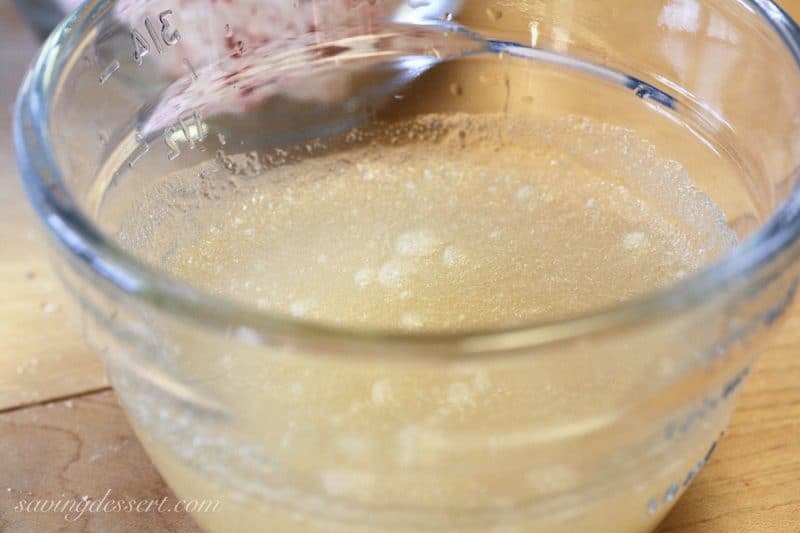 Cool this mixture until room temperature but be sure to watch it carefully. You don’t want it to become set like Jell-O. 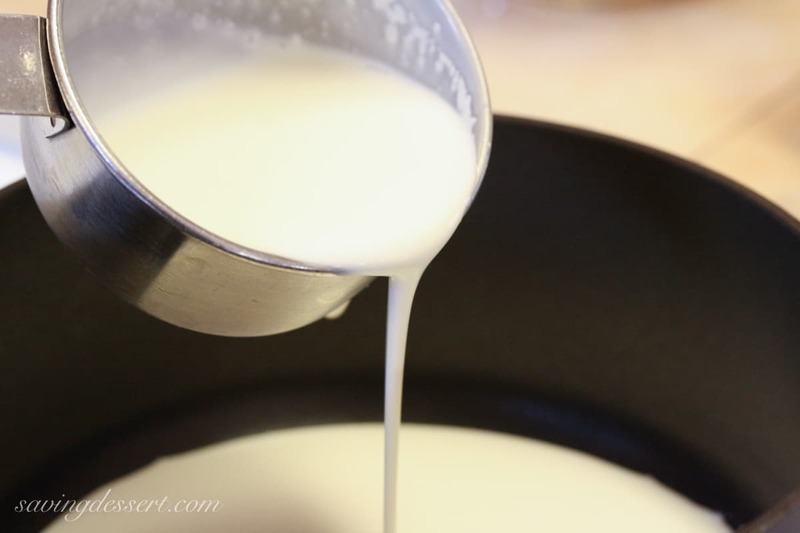 In a separate bowl, beat 1 1/2 cups of heavy whipping cream until stiff peaks form. 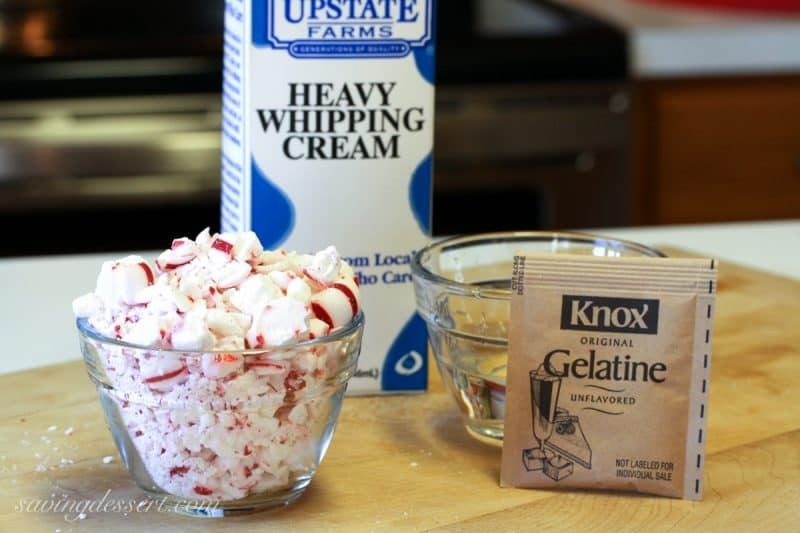 Pour the cooled gelatin peppermint mixture into the heavy whipping cream. 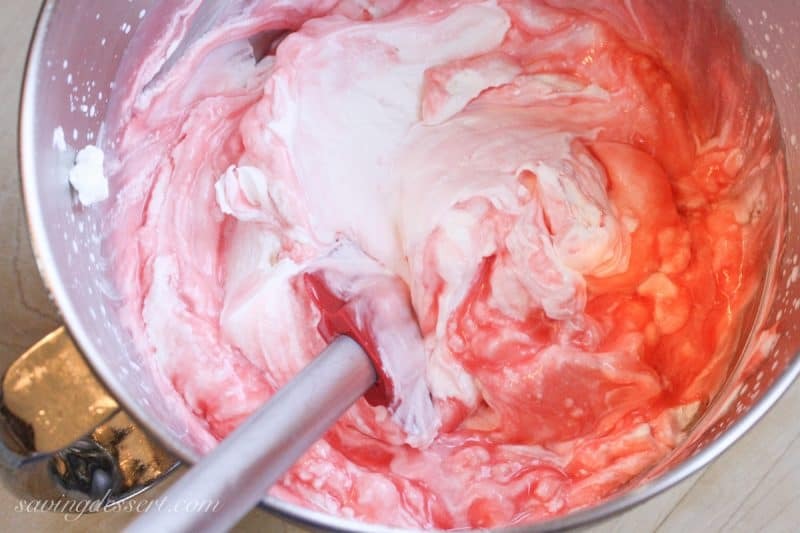 Gently fold the mixtures together until almost completely blended. Pour the filling into the cooled chocolate crust and spread evenly. A pepperminty fresh taste without sugar overload which seems strange since it’s covered in crushed candy! This is a photogenic pie so I took advantage of the daylight to play with the camera. Preheat oven to 350 degrees. 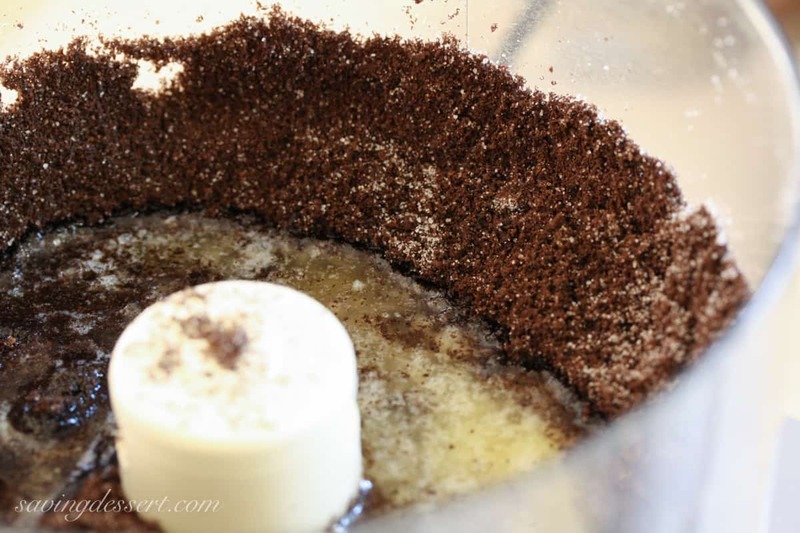 Add the chocolate cookies and granulated sugar to a food processor and pulse until crushed to a fine crumb. Add the melted butter and pulse until mixed. 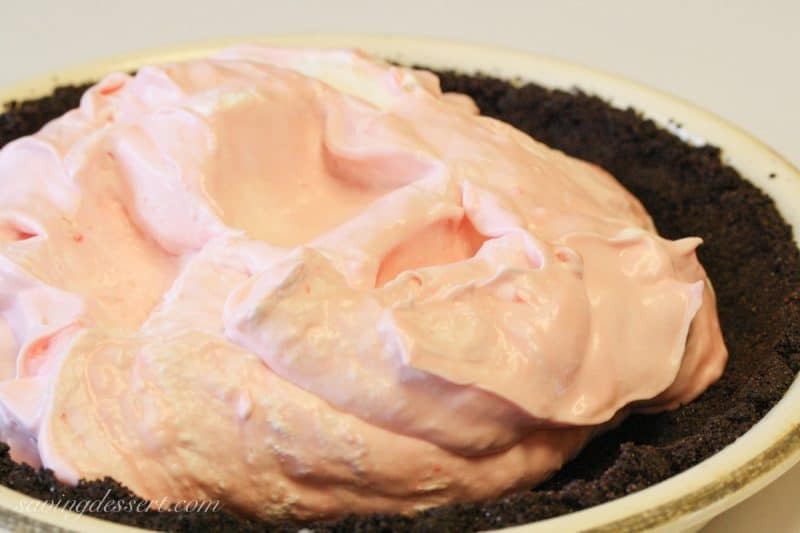 Spray a 9-inch pie plate with Pam. Gently press the crumb mixture into the bottom and up the sides of the pie plate. Bake for 7-8 minutes. Remove from the oven and cool to room temperature. In a small bowl sprinkle gelatin over the cold water and set aside to soften. 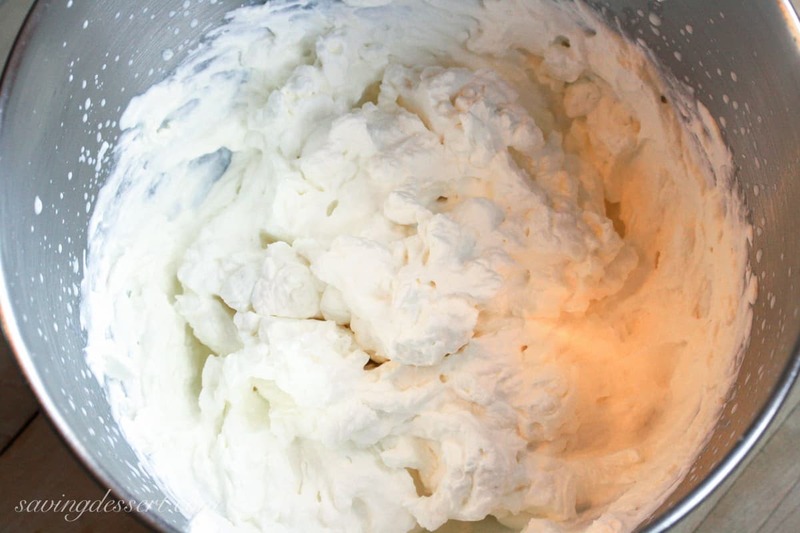 Measure 1/2 cup whipping cream in a small saucepan. Add 1 heaping cup of the crushed peppermint candy. Cook over low heat until all the candy is melted. Remove from the heat and add the softened gelatin and peppermint extract. Set aside to cool to room temperature. Don't allow the mixture to cool too long and become set. Beat 1 1/2 cups of heavy whipping cream until stiff peaks form. 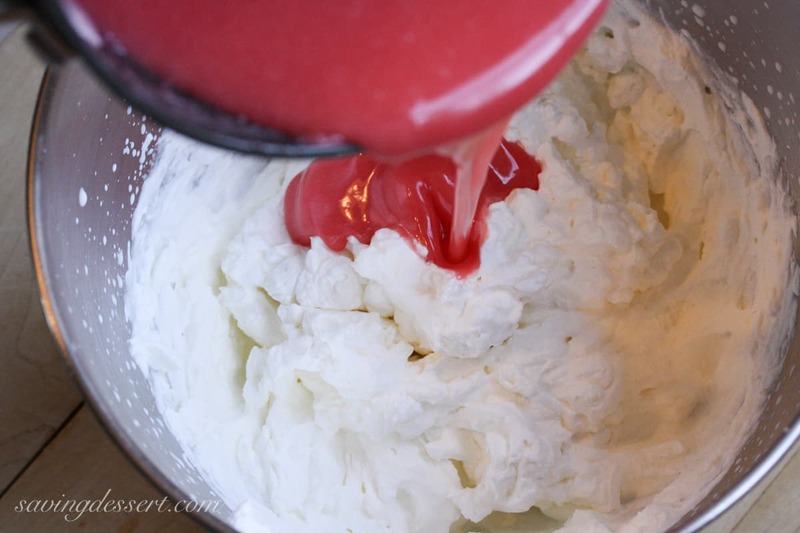 Gently fold the peppermint mixture into the whipped cream until almost blended. Spread the filling into the pie crust and refrigerate until set - about 2 hours. Garnish with additional sweetened whipped cream and crushed peppermints as desired. 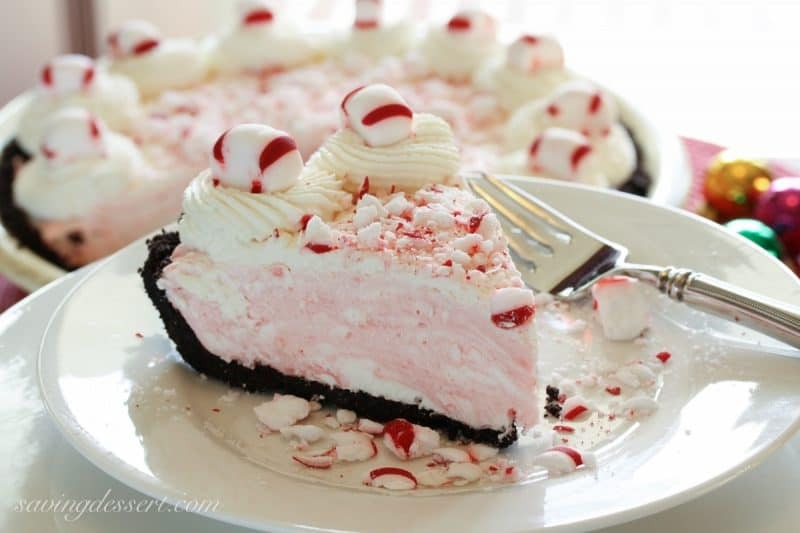 The extra crushed peppermint adds a good sweet crunch to this pie without making it overly sweet. Garnish away! Thanks very much for stopping by! Thanks for reading the pie posts week after week, after week. Thanks to all my taste testers for eating pie even when you wanted a cookie. I hope you and your family have a wonderful week of post-Christmas joy. May the sales be with you! I’m so excited to make this for Christmas dessert but I can’t find soft candies anywhere. Do you think it would work with hard candies? Hi Summer. I don’t think this will work with hard candies. If you are near a Cracker Barrel restaurant, they carry these soft peppermints. You can also get them on Amazon – just search soft peppermint puffs. Good luck and I hope you have a very Merry Christmas and a Happy New Year! This looks and sounds delicious and I plan to make it soon. I am wondering if it freezes well since I would like to make it in advance. Thanks! Hi Julie. I have not tried freezing this pie so I’m not sure. My guess is that it will be fine. I would wait to add any crushed candy decorations until ready to serve. Good luck and enjoy! 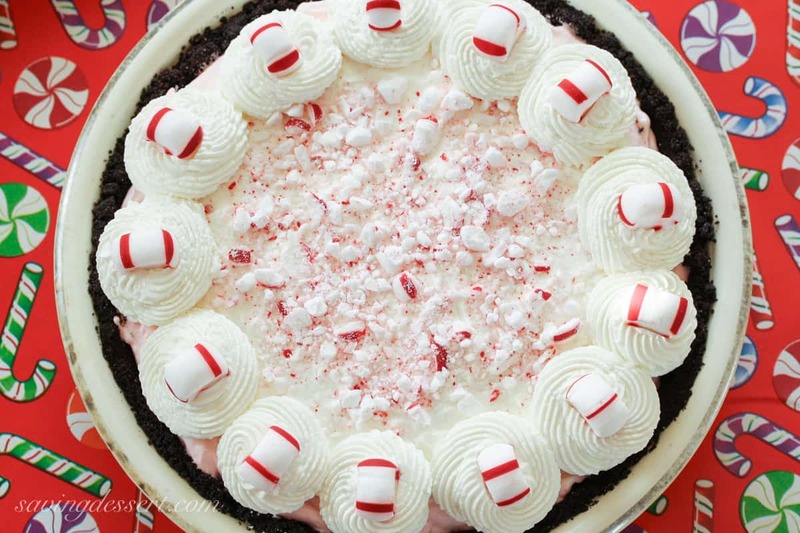 This looks just like Paula Deen’s recipe for Peppermint Pie (which is delicious)! I made this years ago (2004…I think) and everyone loved it. I think I may have to make it again this year! It is Paula’s recipe Sam – I noted that on the printable recipe card. We loved it too – enjoy! Can Oreo cookies be used for the crust? Yes I think that would work! I don’t have a recipe using Oreos but if you do, I’m sure it would be delicious. Happy holidays! We made this today – SOOOO good! Thank you for the recipe. That’s wonderful Tamie! Thanks for letting us know. We appreciate you trying our recipes and for leaving a comment that will help other readers too. I hope you have a wonderful holiday season! Made this for Christmas. We loved it. Beautiful and delish recipe! Thank you. I love this! It looks creamy, and dreamy, and delicious. So glad I stumbled onto your blog. Nice that you want us to follow you on Pinterest…… But where is the link to Pinterest for the recipe ?? Do you not have the "pin it" button on your browser? That would solve the whole problem. I just hit it, select the photo and it's pinned on my board. Easy peasy. Alright Tricia, you need to open a pie shop. I would be the first in line! Tricia, I know it must be kind of bittersweet to be at the end of the 52 Pie Project! You did an amazing job and I have enjoyed seeing your beautiful pies and reading your posts every week. I can't wait to see what you will be up to in 2012!! Best of all to you and yours! 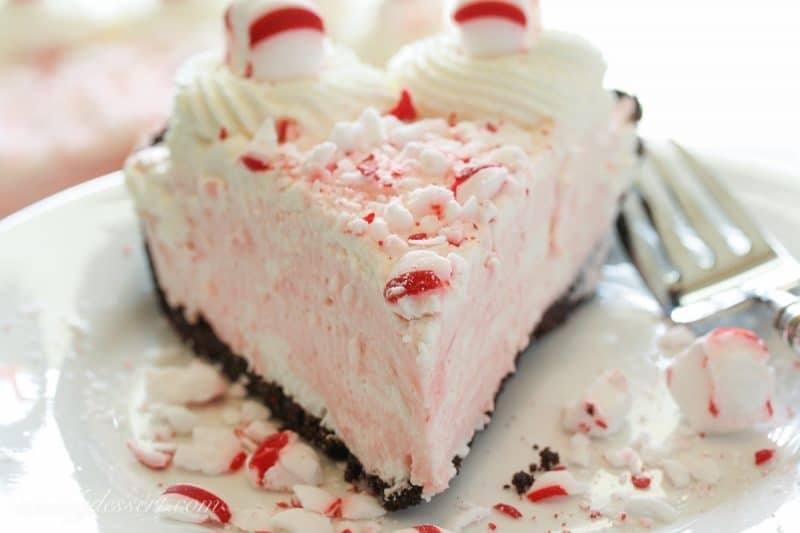 blessings ~ Tanna<br />ps this peppermint pie is almost too PRETTY to eat!! GORGEOUS (great photos!!! )!